This document provides guidance on the application of the Water Charge (Termination Fees) Rules 2009, including amendments, and the amendments to those rules made by the minister under the Water Act 2007. 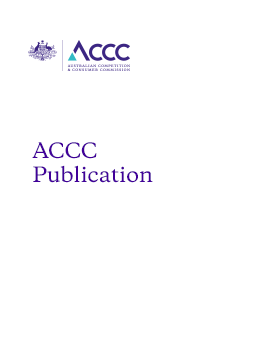 It replaces the ACCC’s previous publication A guide to the water charge (termination fees) rules, December 2011. References in this guide to network service plans should be disregarded. This follows the removal, from 1 July 2017, of the requirement in the Water Charge (Infrastructure) Rules 2010 for certain infrastructure operators (Tier 2 operators) to produce five-yearly network service plans.